Continuing my quest for the perfect Veggie Burger, this is a good one! Continuing my quest for the perfect veggie burger, I’m loving this Zucchini Fritter Veggie Burger, recipe from my friend, This Mess is Ours. Served fully loaded with lettuce, red onion, tomato, and a homemade pesto yogurt sauce, it’s delish! 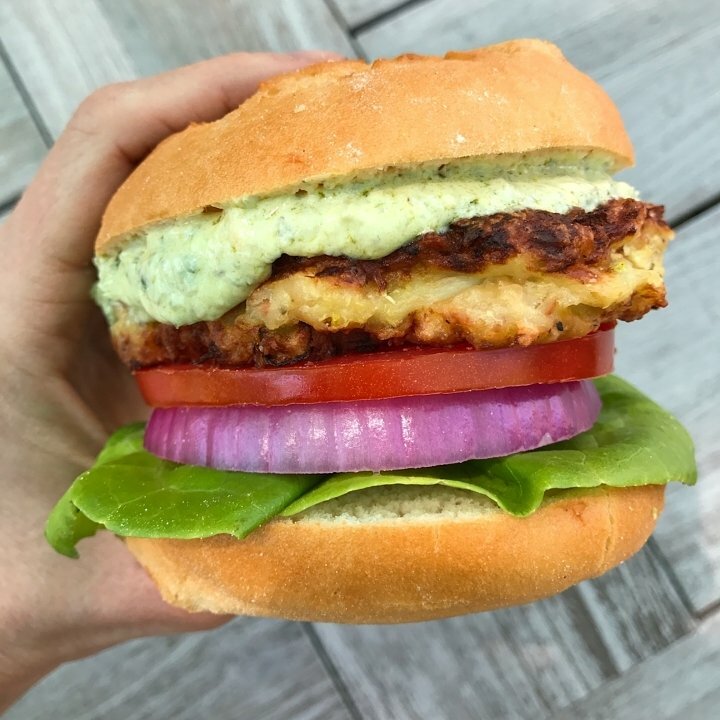 Made with lots of zucchini, cannelloni beans, egg, Parmesan cheese & slivered almonds, the burger is packed with nutrients & flavor, and has a great texture. They are super easy to make and the recipe makes a large quantity which is great for leftovers. I’ll be trying a few more veggie burgers over the next few weeks if anyone has any recommendations. Click here for the recipe from This Mess is Ours. I followed the recipe exactly except the for the Pesto Yogurt Sauce. I used only 1/2 cup of yogurt and 4 TBSP of pesto.